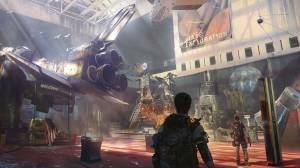 In The Division 2 Settlements are small heavily defended bastions where survivors who have formed a resistance try to make new lives for themselves. If you enter a settlement and provide supplies and complete associated missions the settlement members will sell you items and send people with special skills back to the White House. Recruiting people from settlements will allow you to unlock White House upgrades that includes Crafting and the entire Dark Zone. As well as giving you a safe haven and place to stash your gear Settlements also give you a fast travel point. To unlock these benefits you will first need to upgrade the settlement, this is done by returning to the White House and upgrading your character. Settlements in The Division 2 are upgraded by completing missions. You will discover that the side missions tend to connect most with the settlements and usually involve helping out some of the survivors there. Another source for making progress towards settlements upgrades is completing Story missions and random activities in the area of the settlement. When you complete Pprojects at a settlement you will be rewarded with new gear. Each settlement will have a table where you will be able to view what Projects are on offer. Before you can attempt a Project though you will be required to donate a certain number of resources or specific item types. Once you fulfill the requirements the settlement will offer you a reward which more than likely will be a blueprint for crafting a reusable weapon or mod. Before you either sell or dismantle your old or unwanted gear you may want to consider keeping it for when you enter a settlement as it gives you the opportunity to get a useful reward in return.